Bonus Electrical is the wholesaling division of the East Yorkshire-based, family owned, Bonus Electrical group. Established nearly 60 years ago, the group also owns an electrical retail superstore, a solar P.V. distribution company, and supplies electrical kits to caravan and mobile home manufacturers. Bonus Electrical is the largest independent wholesaler in Hull and a key supplier to local health authorities, councils, schools, colleges, contractors and industry. Bonus also offers its major customers a free call out service during evenings and weekends, the facility for stock holding, and warehousing for a council home maintenance company – with whom they have just renewed a three-year supply contract. In 2013 the Bonus management team was tasked with doubling the turnover in two years. At the time they were using “an antiquated, character based system that was always crashing” and, al­though the old system could not produce the reports they needed, a change of system was considered “too disruptive”. But when it became clear that the old system was collapsing, the search for a new solution began. As a member of the ANEW buying group, the Bonus team asked other members for suggestions. They discovered, however, that many others companies were also using quite old systems and had the same anxieties about the distraction of change. Then the manager of a local builders’ merchant suggested looking at their K8 system. The brief Bonus eventually gave to Kerridge Commercial Systems (KCS), the company that develops K8, and two other software providers, was for a system that would give the company all the business intelligence they needed in a format that was usable and accurate. Staff should also be able to use the system competently as soon as it went live. Said Carl: “We ultimately chose K8 because of the attitude of the KCS salesperson. He really listened to all our concerns and we felt he genuinely understood them. The fact KCS had implemented systems for other electrical wholesalers, whereas the other providers hadn’t, also gave us comfort. Being able to send out invoices by email delivered the first immediate cost and time saving benefits. 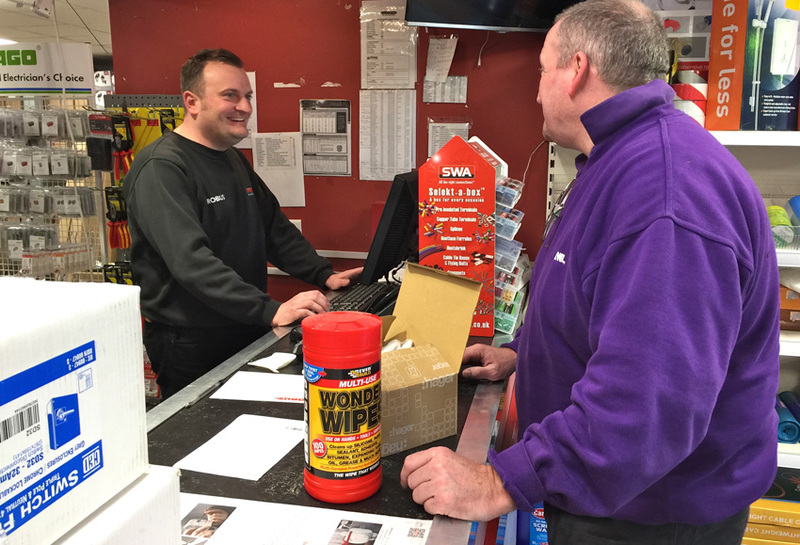 And, on the trade counter, staff were now able to access accurate pricing which speeded up service straight away. The internal sales team was also able to access the customer history they needed more quickly and easily. K8 allowed the Bonus team to set minimum and maximum purchasing levels for the first time. “This means we’re no longer over-ordering stock and less likely to have to pay carriage charges on orders when we’re caught without standard stock on the shelf,” said Jamie. The system also started delivering the business intelligence that the management team so desperately needed and enabled them to start analysing sales in more depth. Jamie said: “Now, at any time during the month, we can look at what a customer has spent over the last month, week or day. We can break it down into product category and can spot patterns and trends that create questions for the sales team to answer. Once a month Jamie provides the management team with a stock figure that would have been impossible to create using the old system. Bonus has recently upgraded its version of K8 to interface with Luckins. The interface works by Luckins loading their files into an FTP server for K8 to pick up. The Bonus team then imports the file, which updates their entire catalogue and products on stock in around 30 seconds. “Maintaining prices on the old system was a tedious process with every line having to be updated manually,” said Jamie. “And now if we need to bring new products into stock, we just provide the part number – it’s just up to us to add the discount. The Bonus management team believes K8 has delivered cost and time savings across every area of the business. They are discovering new functionality within the system as each month passes, such as the logical way it manages stock locations and how it stores and automatically updates customer-pricing information.